Young woman in apron giving male coworker to smell flowers while working outside of flower shop and taking care of flowers. Smiling woman in striped apron standing with coworker at counter in floral shop helping to use laptop while arranging flowers. Young man in striped apron using laptop while woman standing near at counter and taking care of flowers arranging bouquet. Young woman in apron arranging bouquet of fresh flowers and helping male coworker while standing at counter and browsing laptop. 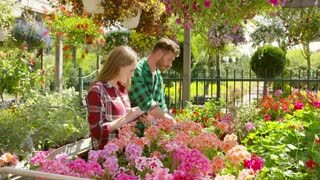 Side view of male and female gardeners taking care and working with flowers in shop in sunny day together. Side view of young man and woman coworkers taking care of flowers and plants in the garden in sunny day.